One encounter with Jesus, our wonderful Lord, can change everything. It did for me! Just as the blind man said following his encounter with Jesus, I too can say: I was blind and now I see … and what I have seen I can never un-see for my spiritual eyes now see with greater clarity than ever before. The lyrics of the song went on with a similar theme to remind me that I am spotless, holy, faultless, whole, righteous, blameless, pardoned, and His forever. I listened to that song hundreds of times over the coming months. No exaggeration, I listened to the song in the car. I listened to it at home. I sang it from the top of my lungs everyday. It was so much a part of all my daily activities that I made everyone else listen to it, too. In fact, it became the theme song of my ministry during that season. I played it at every prayer meeting, every planning meeting, every training meeting, at the conference. But the song was mostly for me. My hard heart was breaking. All my own efforts to “fix myself ” were beginning to crumble as I began to understand who I was in Christ. As weeks turned into months, my heart became more pliable and I was encouraged by what was happening in my life. I was starting to feel alive again spiritually, not realizing that all of this was only preparation for what was ahead. Then … a few months later, it happened: an encounter with the Lord like I had never had. I was on the beach walking and praying after listening to a message called, “Let’s Put the Amazing Back into Grace.” Someone had shared the CD with me before I left for my vacation. Normally I wouldn’t even have listened to this message — people were always giving me stuff to listen to or read and I never “had time,” but God had another plan and this time I listened. The message was on grace, and I had never heard the clarity of the Gospel taught like this before. So much of what I heard in that message was what we would say in church, and it was terminology I had used my entire life as a Christian. Yes, the words were familiar but the message was different … very different. At that time in my Christian life I was in the habit of praying what was called the “Tabernacle Prayer Format.” It’s a method of praying where we would symbolically start at the “gate” and end up in the “holy of holies.” There we could experience the presence of the Lord. It was “seven steps to the presence of God” and was patterned after the Tabernacle system of priestly sacrifices in the Old Testament. The prayer format included lots of confession of sins and asking for forgiveness, and praying things like, “Search me and know my heart, Lord. Let me know if there is any wicked way in me.” After listening to the message on grace, my eyes were beginning to open to this marvelous revelation on the Gospel, and somehow I felt tension in my prayer format. Were there seven steps to the presence of God? I asked the Lord, “Where is the moment of encounter with the Spirit of Grace in my prayer format?” I was getting very close to the encounter with Jesus that I had been waiting for my entire forty-five years of life. I could sense the presence of the Lord walking with me on the beach, and I heard Him say, “Start at the brazen altar.” Eager to obey, I did that. I saw my sin being punished in the body of Jesus. The wages of sin is death. I saw the enormity of His sacrifice and the absoluteness of God’s forgiveness. I was touched more deeply than ever before as I let this truth penetrate my heart. After years of teaching others, I was finally getting it myself! I said, “Lord, is this it? Is this the encounter with Grace?” I was a blank slate, and it was as if I was starting all over. He said, “No, the brazen altar is My mercy. I took the punishment that you deserved. Go on to the laver.” The laver in the Old Testament tabernacle was a large bowl, lined with mirrors and filled with water that stood outside the entrance to a tent, which was comprised of two parts, the Holy Place and the Holy of Holies. So the priest would have to wash in the laver before he could take one more step towards the presence of the Lord. I started my routine “approach-the-laver” prayer: “Search me and know my heart and let me know if there is any wicked way in me...” However, it seemed inappropriate to pray that way because I had just seen the Lamb of God take away my sins at the brazen altar. The Lord said, “STOP praying that, and just look down in the bowl.” I stopped and looked down and was blown away. It was the most pivotal moment of my entire life — and continues to be even to this day! I felt like I was born again at that moment! The joy of my salvation returned in an instant! As I looked down through the water into the mirrors of the laver, I saw what Jesus saw: perfected, blameless beauty. It was glorious. And then I was speechless. “But Lord, (and I motioned back to the brazen altar) but Lord! Look at all my sin! This can’t be!” He smiled at me. I looked at Him and I said, “I don’t deserve this. This can’t be right! This is the most unfair thing I have ever seen!” All of a sudden my first love returned, and I exclaimed, “I love You, Lord. I love You! I will do ANYTHING for You. I want to live for You forever.” His response: “Tricia, I just want you to rest.” All of the pressure I had felt disappeared. All the heavy burdens fell off, and I felt so free that it seemed almost like I could fly. For me at last there was no more “HAVE to” … no more duty-bound obligations. The need for man’s approval, all the exhaustion, the do-do-do mentality, the need to please the Lord all dropped off of my shoulders. With that freedom came the realization that He was pleased with me and had been all along. Nothing else mattered to me at that moment except His love, His acceptance, and His approval. On the beach that day, Jesus gave me revelation of the great New Covenant reality: by His blood all my sin has been removed. All of my condemnation was nailed to the cross. Now I was like Him, raised and seated in heavenly places. I had known the theological facts, but I encountered the Person of Grace, and my spiritual eyes were opened. In that glorious moment my life changed forever. Every day since then has been a more amazing day than the one before. Each day has been full of joy explosions on the inside — even when I have messed up, even when I have had trials, even when I have been hurt by others. Ever since that day, I have been hidden in the secure, peaceful wings of my Father. I am under Grace. I am not perfect in my behavior, but I can say this: I am learning what it means to love Jesus with all my heart, all my mind, all my soul, and all my strength as I experience His love for me. However, I am no longer laboring to convince Him or anyone else of that. I love Him that way because I now know that He loved me that way when He took all my sins away and died in my place, and He continues to love me that way every second of every day. I am in a forever season of gratefulness. Now I know there is only ONE step to the presence of God: the cross of Jesus Christ. The veil has been torn, and I’ve entered into God’s presence. Now I’m inside … forever. This is a passage of scripture that I have read countless times over the past few years because it so clearly states what Christ has done for us. Paul wrote this statement to the Colossians to combat dangerous heresies that were becoming popular in the community of Colosse. One of those heresies denied the deity of Christ. Another heresy was the mixing of law with faith for salvation. Paul wanted the believers to know that Jesus Christ, although God, became a man with flesh and blood so that He could die our death and raise us up in Him. Having finished the work for our redemption, we can say we are in His presence NOW. We are blameless and holy NOW. We are without a single fault NOW. Paul pleaded with the Colossian church to stand firm in this truth because the truth sets us free! Since this revelation of God’s grace began to unfold in my life, I’ve learned to rest in His timing of the process of discovering His great love for me. There seemed to be so much un-doing that needed to take place from decades of believing a mixed up gospel. I had lost the assurance I had received when I first believed. For me the revelation of grace was such a paradigm shift, I felt like I needed to re-learn almost everything I’d ever been taught. It seemed like everything I knew was from the perspective of an unfinished work. My spirit “got it,” but my mind had to be renewed to it. This takes time. …May you experience joy explosions as you get to know our Jesus more and more. I encourage you to rest and allow grace adequate time to grow in your heart. I pray that this study will plant and water seeds that will burst and bring forth the fruit of the Spirit of grace in your life. May grace and truth be exponentially multiplied to you in the intimate knowledge of our Lord Jesus Christ. Click here for comments from pastors and leaders who applaud and highly recommend Unveiling Jesus. I love the title of this book! Unveiling Jesus is exactly what Tri- cia does in this life changing book. The person of Christ and what He accomplished through His finished work is clearly presented and bril- liantly expressed. 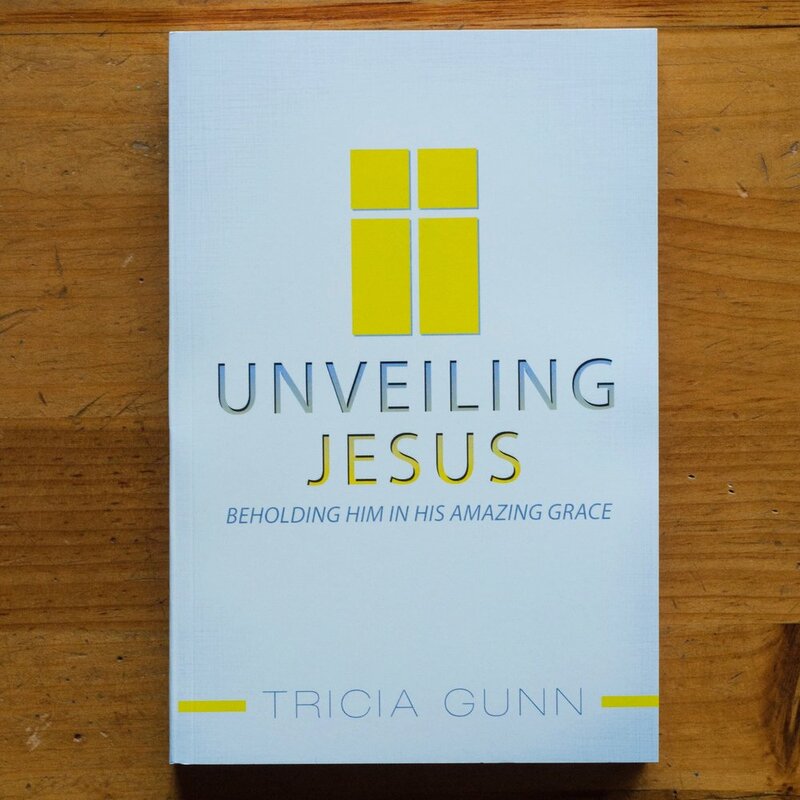 I believe Tricia Gunn will soon become one of the most listened to women in the Body of Christ. I pray that to happen because what she has to say is utterly transformational. Please read this profound presentation of truth that will leave you wanting more from this exceptional teacher! Unveiling Jesus is a banqueting feast inviting the reader to par- take of the Lavish Grace of God. Tricia is an outstanding commu- nicator with an effortless style, unveiling truth in such a way as to draw the reader on a journey of discovery and encounters of the extravagance of God’s Love, Grace, and eternal plan for them and releasing them through revelation from the treadmill of performance Christianity. This book brings clarity and gives you a solid foundation to have confidence before God. If you want more of God, this book is for you. If you need clarity on the truths of Grace, this book is for you. If you have labored under guilt and condemnation and disapproval then, YES, this book is for you! Lastly, if you have already been introduced to Grace and want to grow deeper in this revelation, this book is for you. Tricia, thank you for devoting your gift to God to benefit count- less people and bring them into the Freedom Christ paid for. Thank you for standing in the midst of many voices and hearing and obey- ing The One Voice to Unveil this magnificent Message. I believe Unveiling Jesus should be required reading for pastors and leaders. A revelation and accurate understanding of grace is necessary to be able to receive God’s love and then express that love to hurting people and see them delivered from the power of the dark- ness! It is rare to find a book that is very down to earth and easy to understand, yet filled with sound doctrine that is supported by Scrip- ture. Tricia’s passion for the true Gospel ofGrace is felt throughout her book. Catch the revelation; catch the passion; and see Jesus for Who He really is! Do you wish you had a book that would answer your questions, lead you in the right direction, give you purpose in life, and help you see Jesus as He really is? Ifso, then this is the book for you. Triciais an anointed teacher of the Bible. I have heard her teach and she makes the Word of God so easy to understand. Line upon line, pre- cept upon precept, and faith to faith. As you read this book, freedom will come to your life because it does just what the title says, it unveils Jesus in His Amazing Grace. Every week I teach inmates from this book. In addition to my weekly study, every night they take this book and have bible studies in their cells. I have seen remarkable changes in their outlooks. From rejection to acceptance, and from feeling un- loved to loved as they gain an understanding of God’s unconditional love towards them. I highly recommend this book. It and my Bible go with me wherever I go. Through the scriptures unpacked in Unveiling Jesus, The Father has sweetly wooed me to release my tightly clenched life and to free- fall into grace. When I finally cast all my weight onto the cross, my life burst into color and dazzling freedom. His spirit began to open my eyes to a living walk with Christ, and ministry became unstoppable. I found myself singing all day about His love and effortlessly sharing the good news everywhere — from the grocery line, to my darling husband and children at home. As He continues to deepen my trust and adoration, even life in a storm has become a beautiful adventure, like clenching the feathers on the back of a soaring eagle. Unveiling Jesus has touched myheart deeply. It is nestled among myprized possessions, the lace and pearls of my wedding, because through it I have found that Jesus is my greatest treasure. As I read Unveiling Jesus, it’s like the sails of my soul open up and I breathe in sync with the Spirit. My appetite for the Word and revelation of my intimacy with Jesus — because of Jesus — springs up as I enjoy each page of this book. Tricia’s teaching style, deep understanding of the Father’s heart and love of the Word overflows on each page. Grace flows from every sentence in this book. WARNING: DO NOT READ THIS BOOK IF YOU DON’T WANT YOUR LIFE TO BE RADICALLY CHANGED! I am forever grateful for the message in Unveiling Jesus that God has given Tricia. I am blown away by her desire to study the scriptures and the revelation that He has given her. It is powerful and contagious. It is miraculous, healing, loving and full of grace. This book is a “must read” — and this revelation is a “must get”! What you hold in your hands is a gift that I cannot wait for you to open! After 36 years of being a believer, I had learned a lot and assumed I had heard it all when this gift so graciously came to me. I did not even know that I wanted it. As Tricia’s message gently un- folded and became revelation for me, everything in the gospel made sense, and it was as if I had been born again once again after all of these years. This message of the finished work of Jesus has changed my family as well. The way we talk, the way we relate, our passions, our motivations, our love, our future, and the way we read the Bible have been transformed by the beautiful message ofGod’s deeplove and grace, the gift of his son Jesus. We will never be the same. And we will never tire of it. Enjoy the gift! The magnitude of God’s grace and love is something that is im- possible to put into words. Once you have experienced how freeing it is to live in grace, you can’t fathom falling back in living to please God by your works. Our journey as a family has not been an easy one. We grew up in a Christian home and we were good, rule following, Bible reading children, but there was always an underlying works-based mentality. When our mom, Tricia, had an amazing grace encoun- ter from God, it not only changed her life, but it change our whole family’s life. This book is an excellent representation of our family’s journey of learning about God’s grace and how it really can change your life!